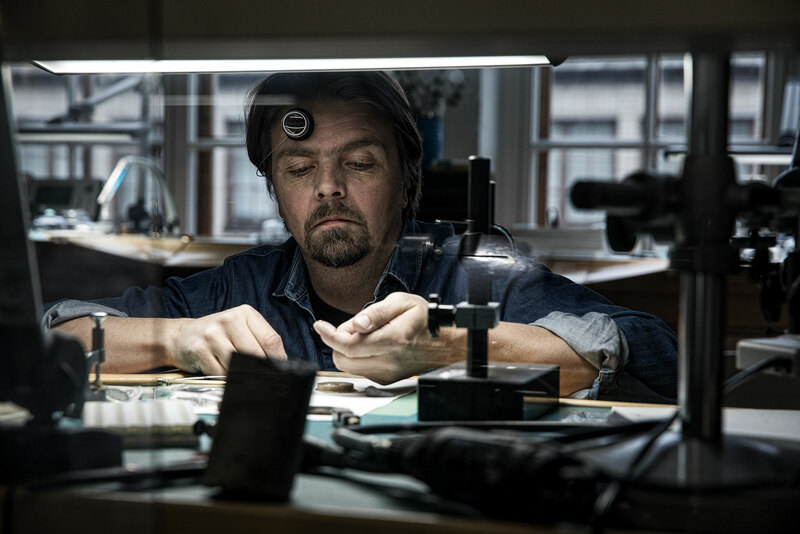 Six years after their first collaboration, MB&F has once again joined forces with the Finnish watchmaker Stepan Sarpaneva to launch the MoonMachine 2 at SIHH 2018. Like the original MoonMachine that was based on the HM3 Frog with the injection of Sarpaneva’s dramatic moon face, the second instalment works off MB&F’s HM8 but adds a lunar touch. 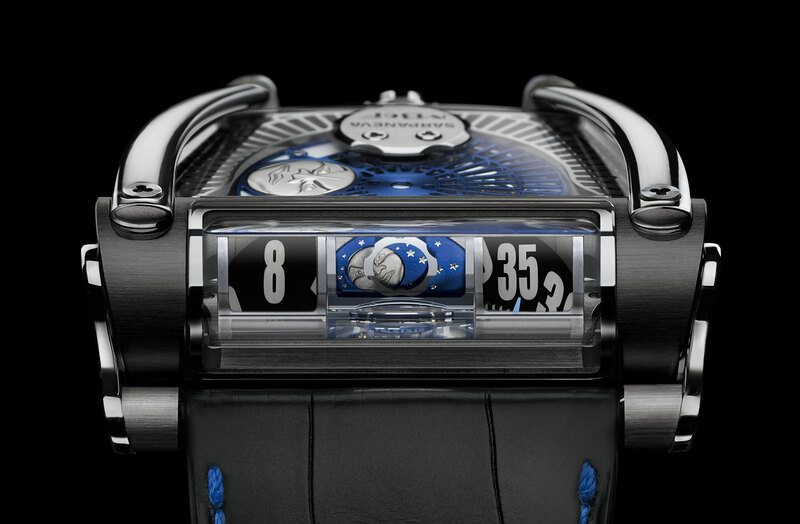 In the MoonMachine 2, both of the HM8’s most notable design features – the battle axe rotor and the prism time display – have been tweaked by Sarpaneva. A moon phase has been added to the digital time display, sitting in between the jumping hours and dragging minutes. A specially cut prism projects the flat time and moon display into the vertical time display window. The prism magnifies the digits for the time by a fifth, but keeps the moon phase true to size so as not to distort it. 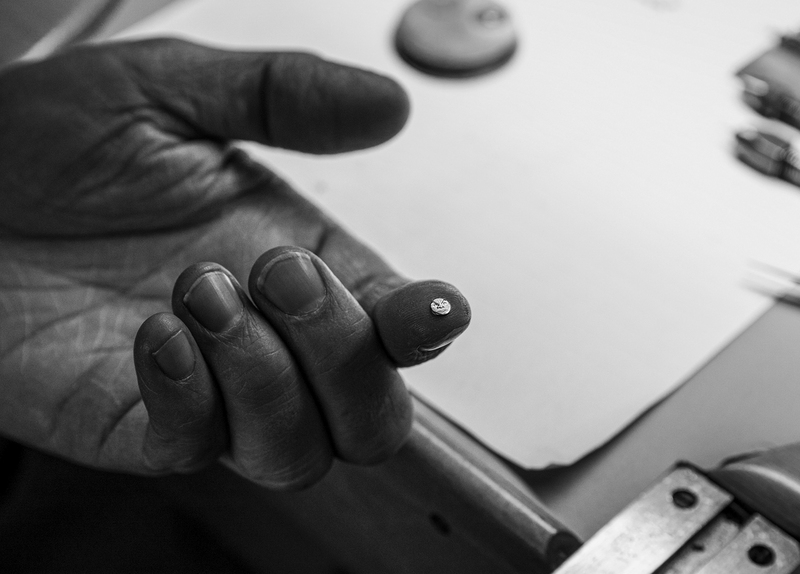 As a result of the additional moon disc, the watch is 19.5mm high, 0.5mm thicker than the HM8. 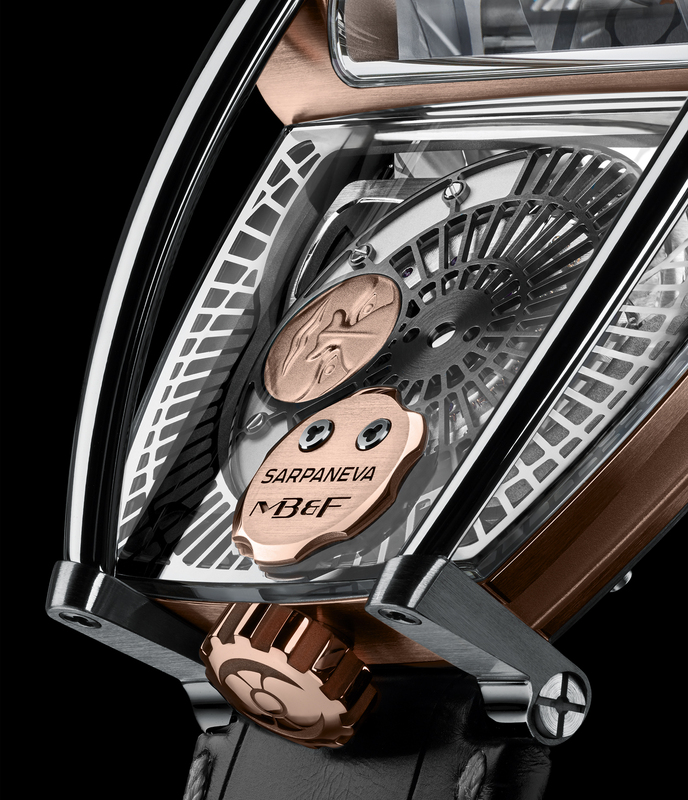 The two gold moons on the moon disc are 4.5mm wide and 0.35mm thick – the smallest ever made by Sarpaneva, whose own timepieces typically feature moons that are 10mm by 0.5mm. 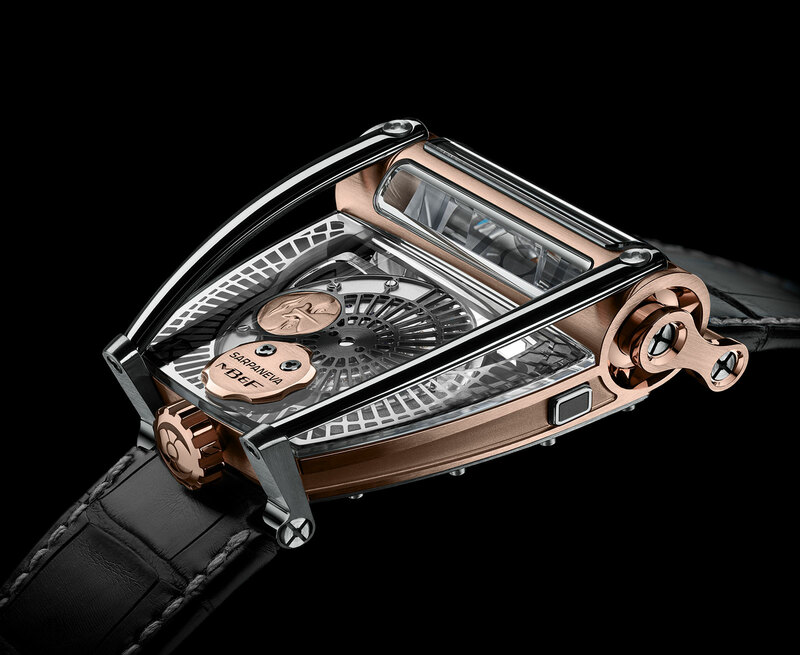 The typical MB&F rotor has been replaced by an radial open-worked oscillating weight inlaid with a Sarpaneva moon face that’s 8.5mm in diameter. 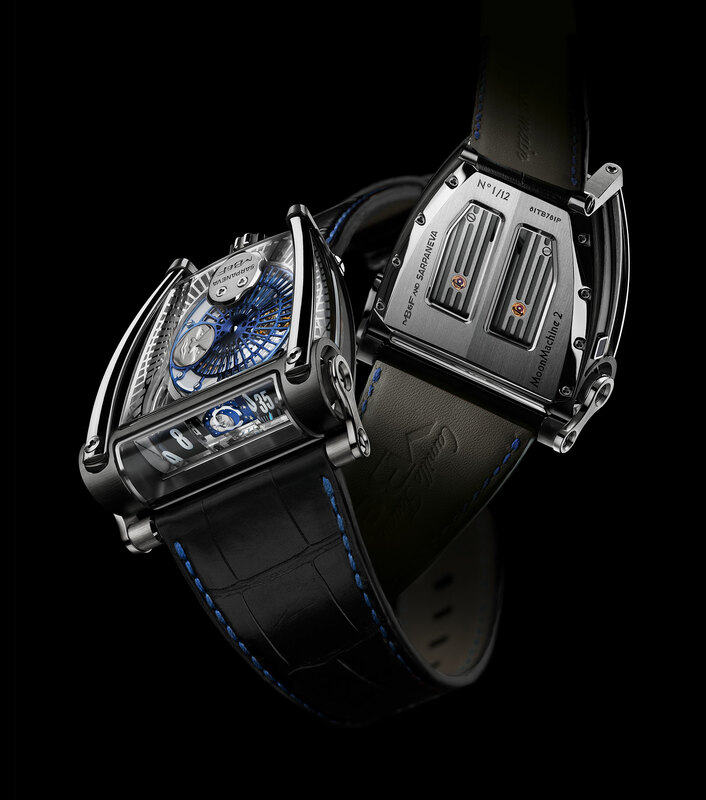 The sapphire crystal on top has been metallised with the same radial motif, which extends from the rotor, almost to the edge of the case. Underneath that all the base movement remains the same, a tried and tested Girard-Perregaux automatic calibre that’s found in several MB&F creations. The MoonMachine 2 is available in three iterations: titanium with white gold moon faces and a light-blue moon disc, black titanium with white gold moon faces and dark blue moon disc, or red gold with titanium flanks, red gold moon faces and an anthracite disc. 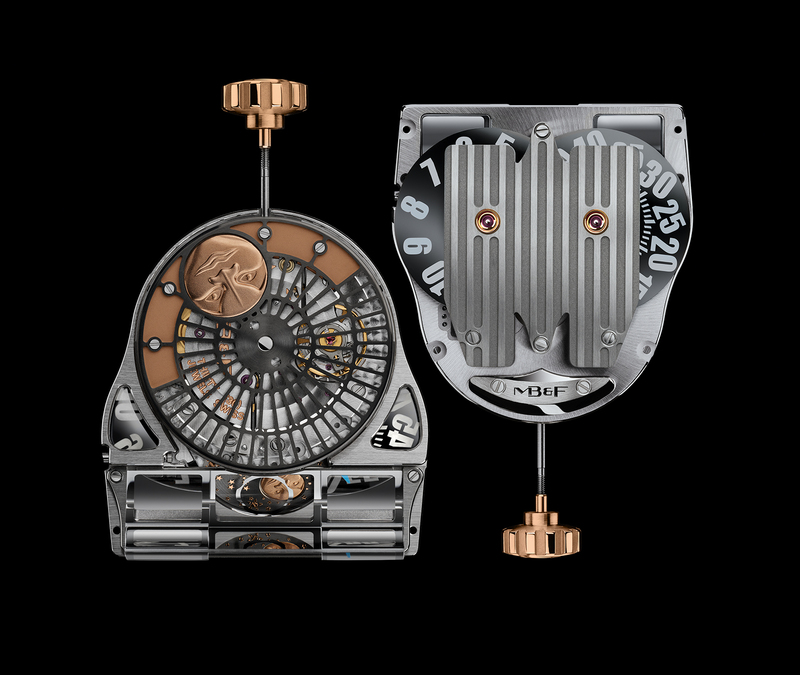 The MB&F MoonMachine 2 in both natural titanium and black titanium are priced at SFr88,000, while the red gold version is priced at SFr95,000. Each is limited to 12 pieces.